Genetics, aging, excessive sun exposure, gravity, and stress can lead to less youthful looking facial and neck contours. This can make men and women in Orange County feel self-conscious about their appearance. When contours of the neck do not match the upper facial area, necklift surgery may be the ideal solution. The Institute of Cosmetic and Reconstructive Surgery offers this procedure to help patients improve the appearance of their necks and renew confidence. Muscle banding in the neck that created abnormal contours. Skin relaxation and excess fat in the lower face that creates jowls. Submental fullness, also known as a "double chin." 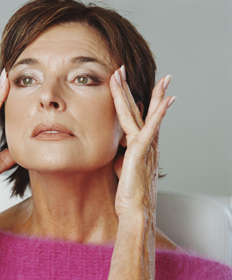 In some cases, we recommend including a brow lift, eyelid surgery, or forehead lift with necklift surgery. Combined, these procedures can deliver optimal results such as a more youthful and rejuvenated appearance. If you want to know if necklift surgery is right for you, we recommend scheduling a consultation with our respected Board-certified plastic surgeon, Dr. Thuan Nguyen. It is important to come prepared to discuss your goals, as well as medical conditions, drug allergies, and previous medical treatments. Dr. Nguyen will want to know about medications you currently take including herbal supplements and vitamins. It is critical to inform him of alcohol, tobacco, or drug use. Dr. Nguyen will evaluate your health and any preexisting health conditions or risk factors, examine and measure your face, take photographs, and discuss the likely outcomes of treatment. If you are a candidate for this procedure, Dr. Nguyen will tailor a plan to meet your specific needs. Good candidates for necklift surgery include individuals who are non-smokers and do not have medical conditions that would impair healing. It is important they have a positive outlook and realistic expectations about treatment. Results from necklift surgery can include a revitalized appearance, improved jawline and chin contours, and a boost in self-esteem. Go after a more youthful look by calling our team at 714-421-4022 to schedule a consultation with Dr. Nguyen.